The Asus Transformer Book TX300 is a well-built machine with bags of power and a unique twist. It's one of our favourite hybrid devices, because usability isn't hobbled by the impossible dream of fulfilling both laptop and tablet uses. Few manufacturers have bought into the hybrid model as heavily as Asus, and the Taiwanese company has been blurring the lines between laptop and since the original Asus Transformer back in 2010. 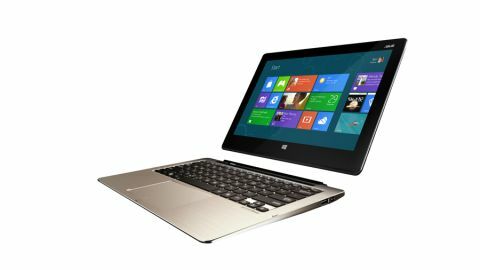 While the original Asus Transformer was an Android tablet with a detachable keyboard dock, the range has expanded with the arrival of Windows 8 to include the Asus Transformer Book. Laptop vs tablet: which is best for a small business? We first saw the range back at IFA 2012, and it's taken this long to see full products hitting the shelves. The Transformer Book TX300 is a 'hero product' for Asus, which means it's unlikely to be widely sold, but is a showcase of the best design and performance. The TX300 is encased in brushed aluminium, giving it a quality sleek finish, enabling it to stand shoulder-to-shoulder with the MacBook Air in the looks department. However, it has a hidden trick up its sleeve. The screen unclips from the keyboard base to turn this 13-inch laptop into a 13-inch tablet, for playing games, surfing the web or watching movies. To the untrained eye, the Asus Transformer Book TX300 is the spitting image of the 13.3" Asus Zenbook UX31A Ultrabook, which is because it's essentially the latter cut in half. It's a new take on the hybrid form-factor, which has become the Holy Grail for manufacturers of Windows 8 devices. The TX300's peers are almost too numerous to mention: the Sony VAIO Duo 12, Dell XPS 12, Asus's own Taichi, Microsoft Surface Pro and even Lenovo Yoga 13 all aim to solve the same problem of bridging the laptop and tablet divide, yet, aside from the Yoga, this Transformer Book is one of the few to stay rooted to the traditional laptop form. It's a smart move from Asus, and one we fully endorse. The problem with most of its competitors is that the keyboard docks are horrifically cramped, suffer poor performance and end up being more expensive than laptop equivalents. It makes the proposition a hard sell to consumers when an iPad can be picked up for £399, and a cramped unusable keyboard purchased for a fraction extra. With the Transformer Book TX300 you get a powerful laptop, rocking a top-of-the-range processor which doubles as a tablet. The only issue, is that this tablet happens to be 13-inches, weighs 900g and costs over £1,000. But is it worth your money? Read on to find out.